Since you spend up to a third of your life sleeping it makes since that you should be sleeping on not only a comfortable bed, but also a clean and healthy one. Many people don’t realize just how much sweat, dead skin, hair and other things end up in their mattress over time. Of course, that’s just the beginning of what might be in there. Things like bed bugs and other tiny creatures also love making your mattress their home. This is why mattress cleaning in Las Vegas is so important. Having your mattress professionally cleaned is the best way to get rid of all these items and return your mattress to looking and smelling like new. Our professional cleaners have the proper equipment and products to safely clean your mattress so all the impurities are removed without causing any damage or problems. We can clean virtually any type of mattress quickly and completely and have it ready for you to enjoy the very same day. Of course, when you start thinking about the potential health effects of bed bugs and other tiny parasites it is easy to see how an unclean mattress can be quite a health hazard in your life. In today’s world where everyone is trying to save money many people are buying slightly used mattresses from friends, family or even hotels. While this is a great way to get a good deal on a nice mattress, it is a little disturbing to think about where it may have been. If, however, you have the mattress professionally cleaned you won’t have any trouble. Mattress cleaning in Las Vegas is a great way to be able to sleep soundly knowing that your bed is clean. 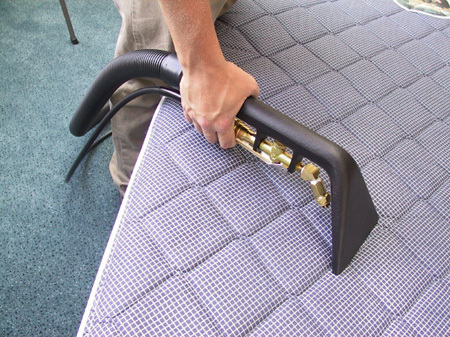 When you have the right equipment mattress cleaning in Las Vegas is not a difficult process. Problems come up when people try to clean their own mattress using a regular carpet cleaner or some other type of cleaning machine which is not designed for this type of use. It will often leave a lot more moisture in your mattress which can then lead to mold beginning to grow and actually cause more problems than it fixes. When hiring the professionals at Green Carpet Cleaning you’ll be able to be confident that your mattress is clean and safe. Most mattress manufacturers recommend having the mattress cleaned about once a year in most cases. If you smoke in the house, sleep without sheets or have several pets then it might be a good idea to do it more frequently. Give us a call today to schedule a time to have your mattress cleaned professionally.